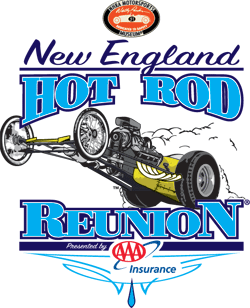 Epping, NH – The coolest cars in the Northeast will proudly be on display Sept. 12-14 during the NHRA Motorsports Museum New England Hot Rod Reunion presented by AAA Insurance at New England Dragway. Three days of classic cars, nostalgic quarter-mile drag racing, and honoring the legends of drag racing will take place at the scenic facility outside of Boston. The event comes to life Sept. 12 at 8 a.m. as hundreds of vintage show cars pour into the facility for the start of the Show ‘n’ Shine featuring a streaming parade of hot rods, classics, and customs that will be on display during the event. Gates will open at 8 a.m. each day of the reunion. The racing on the dragstrip begins Friday at 9 a.m. with nostalgic nitro quarter-mile drag racing. Cars that raced during the early days of the NHRA and New England Dragway will thrill those in attendance with passes down the track in a salute to days past. Time trials, qualifying, and exhibition runs will be showcased during the day. The first day of the reunion concludes in exciting fashion at 5 p.m. with a jet car running at more than 200 mph. Flames, smoke, and the sound of a screaming jet engine is the perfect way to end the day. Saturday will be the day that the legends take center stage at the event with a reception and autograph session at the track. Two autograph sessions will take place featuring grand marshal Bob Frey. Also honored will be Gil Coraine, John Healey, Al Hanna, George Weiler, and “Jungle Pam” Hardy. The Hot Rod Reunion Reception takes place at noon and is a perfect way to hear from the honorees at the event. Saturday’s finale features the world-famous Cacklefest parade on the dragstrip. New England Dragway will come alive with the sounds of dozens of nostalgic race cars from yesteryear. The exhaust pipes on these machines glow red, and fans clamor for the sights and sounds of the dramatic day-ending event. The weekend concludes Sunday with eliminations starting after the pre-race ceremony at 10:45 a.m. Also taking to the track will be an encore Cacklefest and another jet-car exhibition. • SCHEDULE: The event begins at 8 a.m. each day, with racing beginning at 9 a.m. Friday, Sept. 12; racing starts at 9 a.m. Saturday Sept. 13, and 9 a.m. Sunday Sept. 14. • TICKETS: Single-day tickets are only $25; three-day tickets are $75 at the gate; and children 15 and younger will be admitted free when accompanied by a paying adult. Auto Club members, Show Your Card and Save on admission. • ON THE WEB: For more information, log on to www.nhramuseum.org.